Ordination of Priestesses and Priests, by Olivia Robertson is now available in paperback through Amazon.com and all European Amazon websites as well. "The seed of Divinity lies within all beings. Consciousness of this truth brings willing participation in the Divine Plan. It is to become son and daughter of the Deity whose work one undertakes, rather than an unconscious tool serving through faith and hope. Every human being is potentially of the Priesthood. Conscious acceptance of this, and willingness to serve the cause of Deity makes your active Priest and Priestess. . .Yet what does the Priestess rule? Not men, nor races. 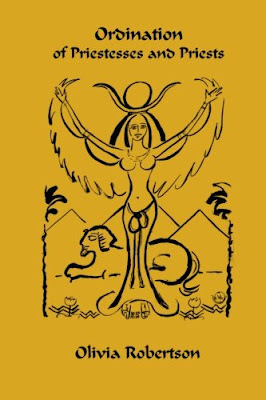 She rules the striving elements of her own being, and through understanding the law of transmutation, creates harmony of mind, heart and body. So may she teach others that which she can do herself."